to reinforce and strengthen the law. 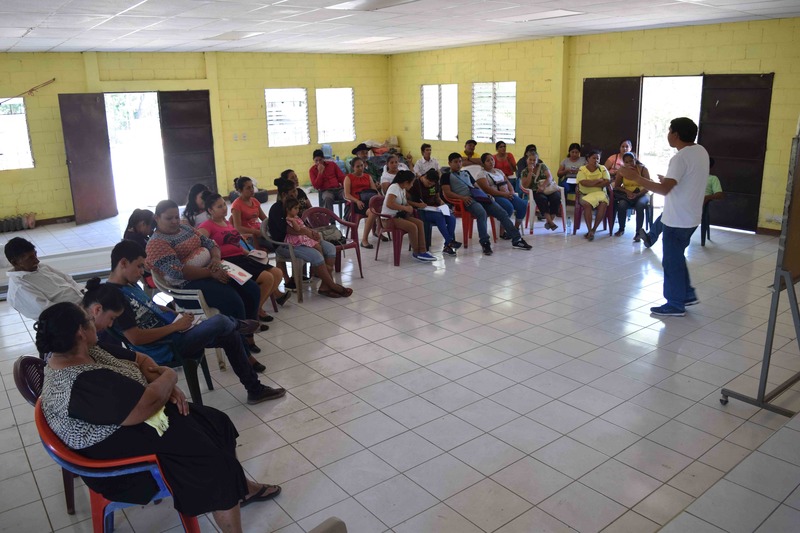 On March 4th, El Salvador voted overwhelmingly right-wing in its local government and legislative assembly, this means that many of the initiatives and laws, like the anti-metallic mining law victoriously won last year could be daily overturned. Many of the new legislative assembly member are pro-mining, some to the degree of being associated with mining tycoons. These activists, demand that the law not be overturned, ignored or slowly taken apart. The civil society also called on the Catholic church to recommit their support in the face of this apparent threat. 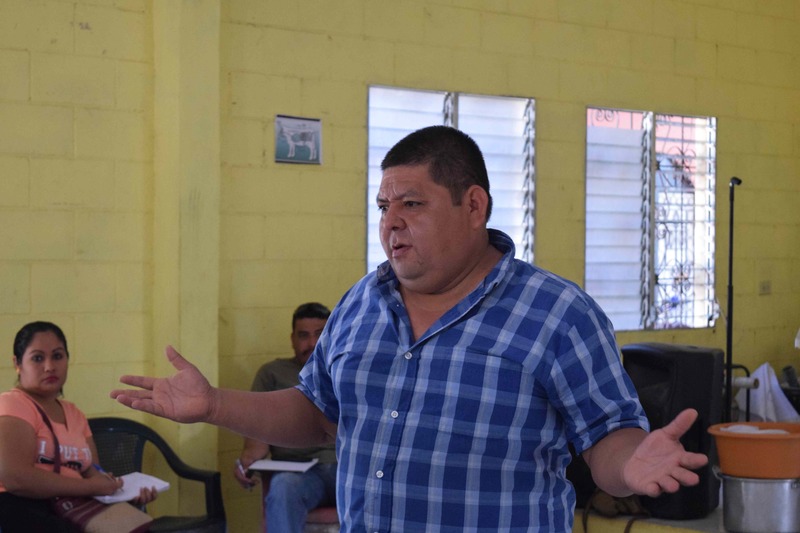 The groups propose that the anti-mining law previously decided upon during the last administration to be ratified, or uphold, in order to ensure the environmental sustainability of El Salvador. They also continue to demand the consideration and ratification of the laws guaranteeing the right to Water and Food Security. 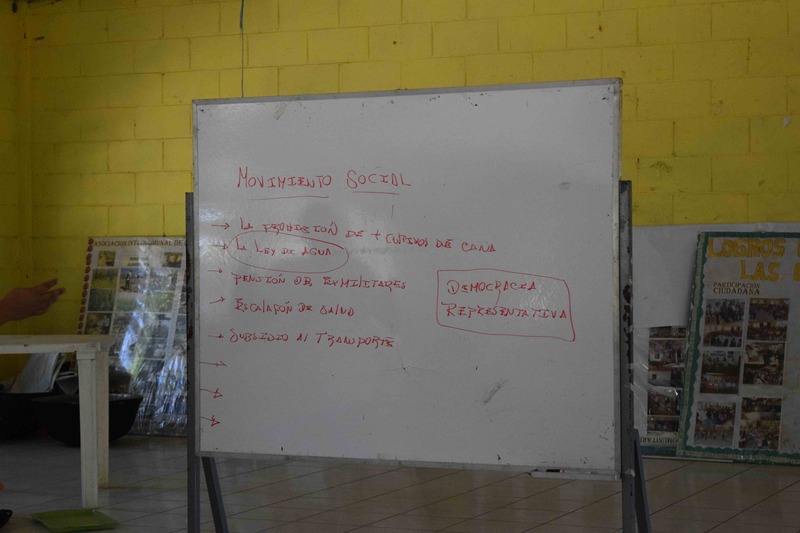 WATCH The beginning of a ten month training course called the “School of Political and Ecological Formation” for Bajo Lempa community leaders in ACUDESBAL. 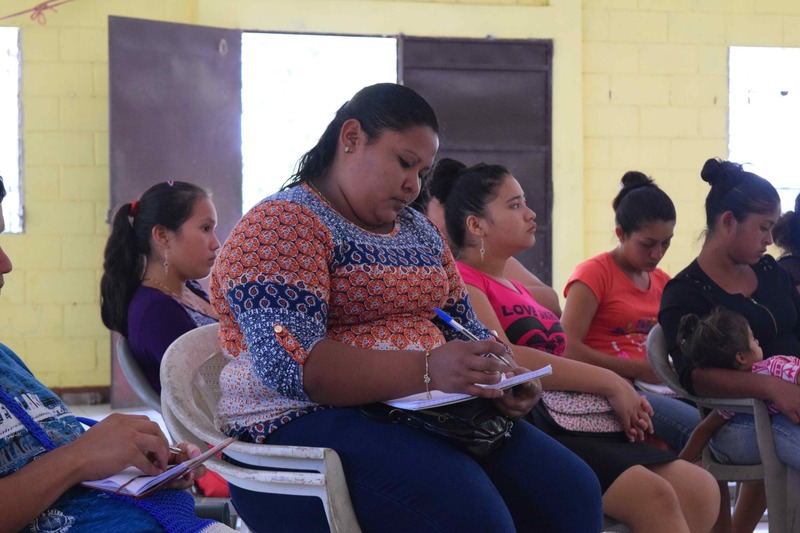 Throughout the year, VOICES will facilitate these types of trainings to ensure our Salvadoran partner communities have the ability to advocate for important changes and get the results they deserve. Stay connected this year via Facebook and YouTube! Despite a short 72 hour notice, some three hundred people from across the country, descended on the courtyard of the Legislative Assembly in San Salvador to be be present during one of the most historical votes in the counter’s recent history. Today was the result of a persistent movement led by communities, national and international environmental organizations, universities, politicians, lawyers, scientists, health professions and most recently, even the Pope himself, recently joined the cause. According to the UN, El Salvador has the second highest degree of environmental deterioration in the Americas, with only 3% of intact natural forests, soils ruined by inadequate agricultural practices and more than 90% of contaminated surface waters. 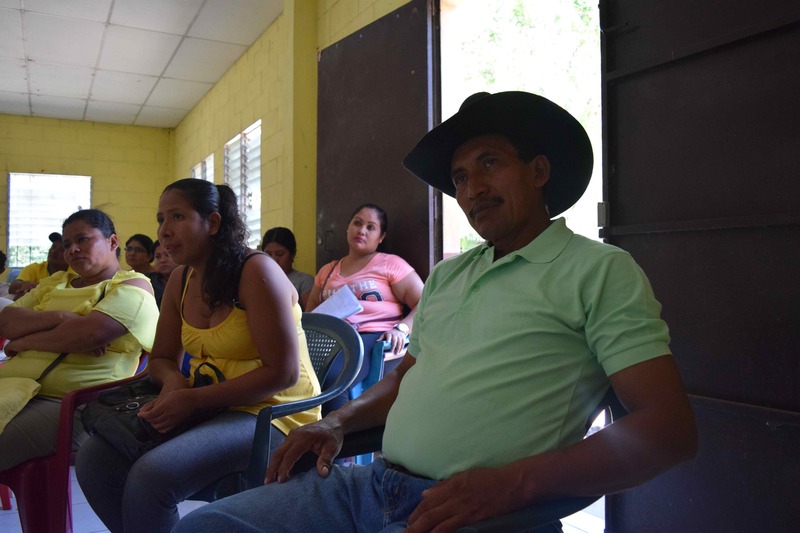 A recent study by the Central American University José Simeón Cañas (UCA) revealed that 90% of the population demands that the Government take immediate measures to prohibit this putrid industry. Today was not only a victory for the Anti-Mining activists but it also gave a glimpse of hope that the Water Rights Act, another overdue, essential bill could finally be put before the same assembly and passed. 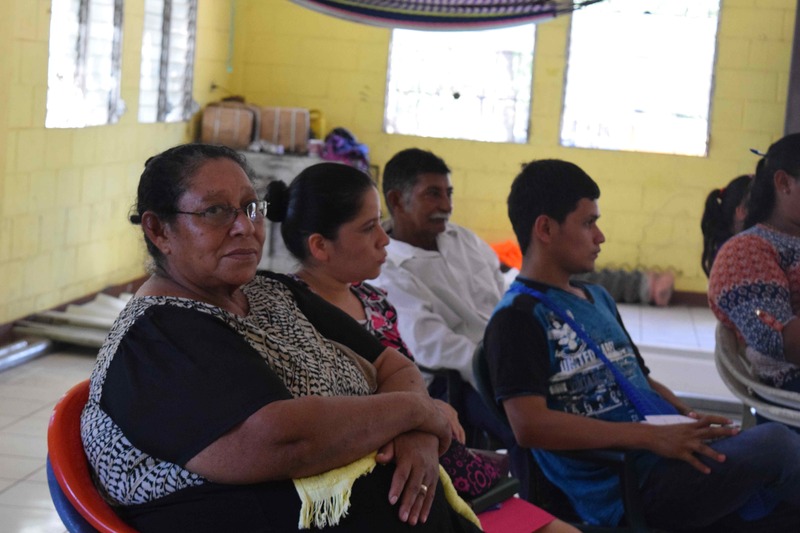 Both laws go hand in hand in the protection of the most basic and important human right of Salvadorans; the right to a dignified and healthy life. A pesar de un breve aviso de 72 horas, unas trescientas personas, representado varios regiones del país descendieron al patio de la Asamblea Legislativa en San Salvador para estar presentes durante uno de los votos más trascendentales de la historia reciente del país. Hoy en día, fue el resultado de un movimiento persistente liderado por comunidades, organizaciones ambientales nacionales e internacionales, universidades, políticos, abogados, científicos, profesiones de la salud y más recientemente, incluso el Papa mismo , se unió a la causa. Según la ONU, El Salvador tiene el segundo mayor grado de deterioro ambiental en las Américas, con sólo el 3% de bosques naturales intactos, los suelos son arruinados por prácticas agrícolas inadecuadas y más del 90% de las aguas superficiales son contaminadas. Un reciente estudio de la Universidad Centroamericana José Simeón Cañas (UCA) reveló que el 90% de la población exige que el Gobierno tome medidas inmediatas para prohibir esta industria pútrida. Hoy, no sólo fue una victoria para los activistas antiminerales, sino que también dio un vistazo a la esperanza de que la Ley del Agua, otro proyecto imprescindible y atrasado, podría finalmente ser sometido a la misma asamblea y aprobado. Ambas leyes van de la mano en la protección del derecho humano más básico e importante de los salvadoreños; El derecho a una vida digna y sana.